HICAGO For more than 20 years, the two men have worked shoulder to shoulder behind the chopping boards at Robert's Kosher Fish Market on Devon Avenue. One elderly and Jewish. The other young and Mexican. An odd couple in matching white aprons, they weave around each other to wait on a customer, weigh a slab of whitefish or answer the phone, in what has become a finely choreographed, behind-the-counter ballet. Robert Schuffler, 90, is the man who gave the shop its name. A great-grandfather with a lopsided grin, bushy eyebrows, a shock of white curly hair under his blue flat cap, he moves slowly these days - back hunched, feet plodding. Around him bounds Arturo Venegas, 38, a dark-haired man with kind eyes who radiates energy as he polishes the steel counters, hoists boxes heaped with ice and fillets a piece of salmon with a deft flick of his silver knife. 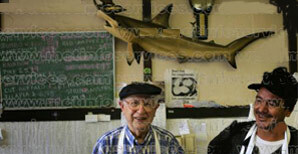 Schuffler once gave Venegas a job and eventually taught him everything about the fish business. And now, roles have reversed in the tiny shop that smells like the sea. Venegas  once a young immigrant who came to this country with nothing - has become the owner. And Schuffler  who opened this shop in 1976  plays the assistant. Life in the fish market rolls along. The daily rhythm of customers like an ocean tide, as people cycle in and out the door. The relationship between the two men a reminder of the age-old reciprocity between the generations. The old teaching the young and, in turn, the young caring for the old. Schuffler is now retired. His children live out of state, and his wife died in 2002. So today, he wants nothing more than a bit of companionship. And Venegas, it turns out, has much to give. He keeps an apron ready for Schuffler, who continues to work behind the counter every day. The men have become like an old married couple, their lives intertwined with shared experience. When Schuffler was in the hospital recently, Venegas came to visit. And when Venegas had a run-in with the Kosher authorities four years ago in a dispute over some smoked salmon, Schuffler intervened. Neither man will gush about their feelings. Schuffler shrugs and says, "It's a close relationship, and how else can I tell you?" But a few minutes later, he drops his voice to a near-whisper as if he is telling a secret and says: "When my wife died, he closed the store and came to the funeral. Yep, he closed the store. That should tell you something." They met in 1983. Venegas still remembers the day. "It was right after Passover," he recalls, in a sing song lilt in slightly accented English. "A warm day in April." Venegas was about to turn 14 and spoke no English when he came looking for work. The ninth of 11 children born to a migrant worker and a housewife in Michoacan, Mexico, Venegas had arrived in the U.S. three months before, walking across the border with less than $20 in his pocket. Back then, Schuffler was already in his late 60s. He had built his life around his family; both his children had become gastroenterologists. He had made his little market a success, but the old man had no one to teach. No one, that is, until Venegas walked through the door. That first day, Schuffler - who had emigrated from Latvia when he was 6  saw something of himself in the eager young man. There had been other employees, but "no one had the get-up-and-go" like Venegas, Schuffler recalled. Schuffler showed his apprentice how to sweep the floors and wipe counters. He didn't speak Spanish and so pantomimed instructions. For months, the two men communicated in hand signals. Gradually, Schuffler handed over more responsibility, showing Venegas how to see that fish is fresh (look for clear eyes), how to carry the whitefish (hold it by the head), and how to slice a perfect fillet (use a single sweeping movement). Over the years, Venegas mastered English and became a legal citizen. He learned to keep the books and handle billing. He mastered the rules that govern Kosher fish markets (no shellfish, no scaleless fish, and no bread in the shop during Passover). In 2000, when Schuffler was 83 and becoming tentative with the fillet knife, he helped young Venegas buy the business, a move that likely made Venegas the only Mexican running a Kosher fish market in Chicago. After the deal closed, their relationship might have ended with a handshake. But Schuffler wanted to keep working. And Venegas wanted him to stay. "To me, it's amazing. Who was going to think that I was going to know this person?" said Venegas. The reversal of roles is proof that " you never know what's going to happen in the world." These days Schuffler walks through the door every day around 10 a.m. He ties on an apron, sits on a white plastic chair beside a hulking ice chest and, in his deep gravelly voice, greets each customer by name. For him, the little shop is a second home. Every customer is part of a familiar parade of faces he has watched for half a century. By early afternoon, Schuffler is at the counter, cutting trout. At his side, Venegas works a piece of salmon. When Venegas fillets the fish, removing the skin in a fluid movement, Schuffler smiles, points to his protege and declares proudly: "See that? No fish is wasted. Look how perfect!" Venegas, gently needling the old man, replies with a wink, "Sometimes the student surpasses the teacher."